Noho: Last night, the Astor Center gave Alinea and molecular gastronomy fans the rare chance to try Grant Achatz's famous dishes outside of Chicago at the Alinea Experience, a book signing/tasting/meet and greet with the chef. 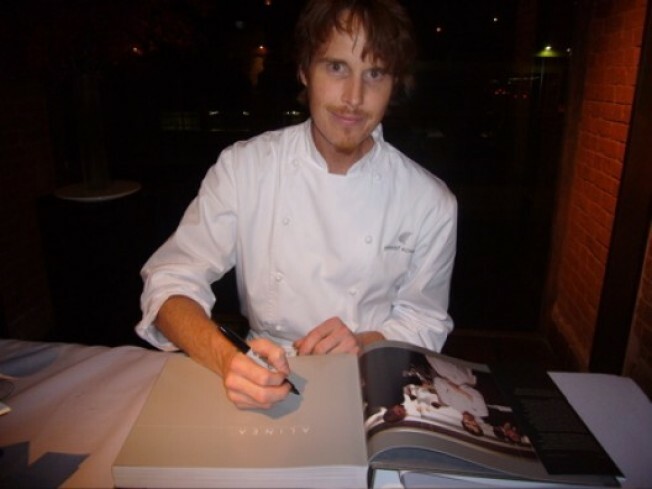 After a brief demo, Achatz spent most of his time stationed at the book signing table, as he worked his way through a line of fans that didn't subside until the party wound down at 9:30. Meanwhile his chefs manned five stations of "bites": dehydrated bacon with caramel, butternut squash (that one ate—no hands—off a specially designed skewer), an orange curried something or other rolled in "basil ice" (kept frozen by a bed of dry ice) alongside a quince slice, and Achatz's famous hot potato/cold potato and black truffle explosion. Wait time for the latter bites: up to half an hour, a fact that was somewhat frustrating to guests who shelled out the $225 for the experience, but unavoidable when you see how impossible it is to make the intricate dishes in mass quantities. Achatz, while happy to be in New York, seemed a bit exhausted (NB: We spoke to him at about the two hour mark of his book signing/fan meet and greet, so we see why). He says a New York project is definitely not on the immediate horizon but is always a possibility. Where did he take his cadre of chefs the night before the event? Why Ssam Bar of course. His chefs manning the stations were eager to explain the components of the dishes, talk up the restaurant, and otherwise share their excitement that Grant let them out of their cages for a few days to come to New York. One first time visitor was determined to go not to wd~50 or The Pig, but to the city's best pizza and hot dogs joints to compare them to Chicago's.